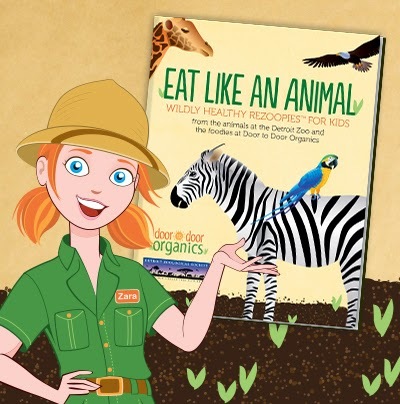 Door to Door Organics has partnered with the Detroit Zoo to create a fun, colorful ReZoopie® cookbook to help you tempt your kids into eating healthy fruits and vegetables, just like their favorite animals. You can check out your free copy of the cookbook here. There are great, inventive ways to use the goodies you may get in a Door to Door Organics fresh box, as well as a few tidbits about the animals who may enjoy them too! Take a look and see what you'll make first. We've gotten the Door to Door Organics boxes before. It's a fun way to try some new things and have fresh favorites delivered to your door! If you're a new customer, use the promo code DETROITZOO for $10 off your order. For a chance to win a $100 Door to Door Organics card and a family four-pack of tickets to the Detroit Zoo Wild Lights show this month, keep reading! To enter, just post a comment on this blog post with your favorite recipe from the ReZoopie® cookbook. Want another chance to win? SHARE this post on your blog or Facebook and come back to the comments here and let me know. All entries must be received by Wednesday, December 10 at midnight ET. I'll draw a winner the old-fashioned way (via Random.org) Thursday morning. My favorite recipe is the PORCUPINE PICK-UPS. Totally up my alley. My favorite is the CHIMPANZeE-LICIOUS PASTA. Shared on facebook too. Elanos roasted veggies! We love to roast veggies in our household. It's the only way to go!!! On my way to post this contest now!! !